Greetings from Art in Site! What seemed like an eternity to publish has been accomplished. The 'baby' has been delivered! We thank you for your patience in riding it out with us. 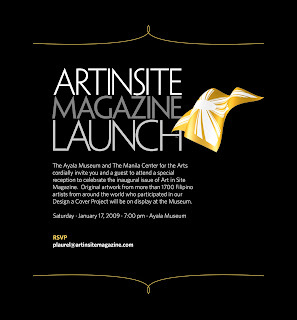 Please find attached to this email our invitation for you to attend Art in Site Magazine's launch on January 17 at 7pm, to be held at the Ayala Museum. All artwork submitted by Filipino artists from around the world will be on display. Your very much-appreciated participation and contribution were chosen by a panel of judges and will grace the cover(s) of the magazine. Your magazine will be sold at the launch to kick off the start of our fund-raising drive to cover expenses of the magazine's publication and printing costs. The rest will be applied to the future Manila Center for the Arts. Art in Site Magazine is not just any arts magazine. It is the literary vehicle for what will soon be the Manila Center for the Arts. The Center shall be a convening venue that will serve as a cooperative for Filipino visual and literary artists. It will support all Filipino artists, whether in the Philippines or abroad. In a nutshell, Art in Site (AIS) Magazine is for, by and about artists. Filled with insightful and engaging articles relating to the arts in all its forms, AIS is poised to incite a renaissance; a rekindled interest in local art, artists, and a renewed sense of pride to be Filipino. The magazine will be distributed in the Philippines and the U.S. to promote and showcase our untapped brilliant and artistic talent. As the launch draws near, we, at Art in Site would like to take this opportunity and thank you for your unselfish participation in this very important endeavor. As we are very mindful of copyright infringement and the privacy of all artists, we are asking your permission to sell the magazine with your cover at a higher price than that of the newsstand price of 400 pesos. We are hoping to sell the covers at 3,000 pesos (first come, first served basis) to help defray the cost of publication and to continue with the work we set out to do for you and for the sake of the artists' community. Your generosity in allowing us to retain the proceeds would be very much appreciated. If you wish to partake of the proceeds from the sale of your magazine, please feel free to approach any of us at the registration desk. Taos puso kaming nagpapasalamat sa inyong malaking tulong. Thank you very much.